We were so blown away by all the clever entries we received for our trick-or-treat tract contest last month that we’ve decided to host another one for Christmas. The holidays bring so many opportunities for remembering those around us — neighbors, mail carriers, teachers, house keepers, etc. What better time to share the good news of Christ’s love? Jesus is the reason for the season, after all. 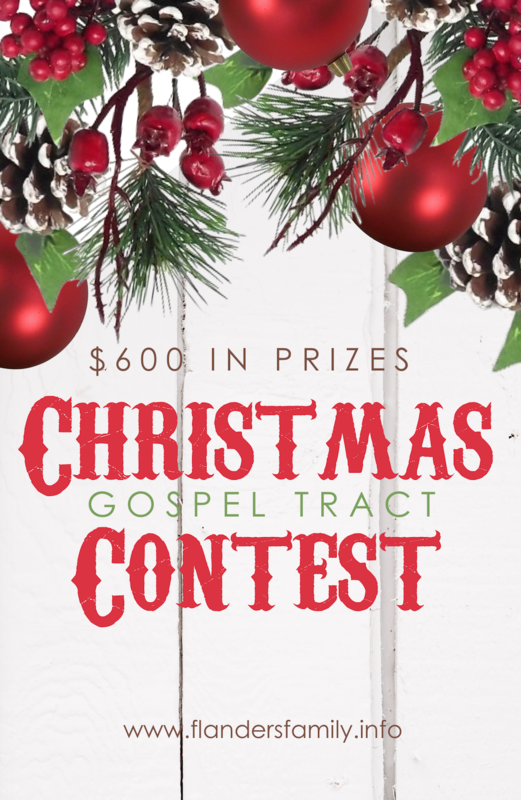 For this contest, we’d like to see your best ideas for presenting the gospel in a Christmas-themed tract. Please use the same single-fold, 4-page format as before. Once again, we’ll be awarding prizes to the three top winners. But get your submissions in soon! The deadline for entering fast approaching! Keep reading for complete details and submission guidelines. All entries must be received by 11:59 PM on Saturday, December 8, 2018. 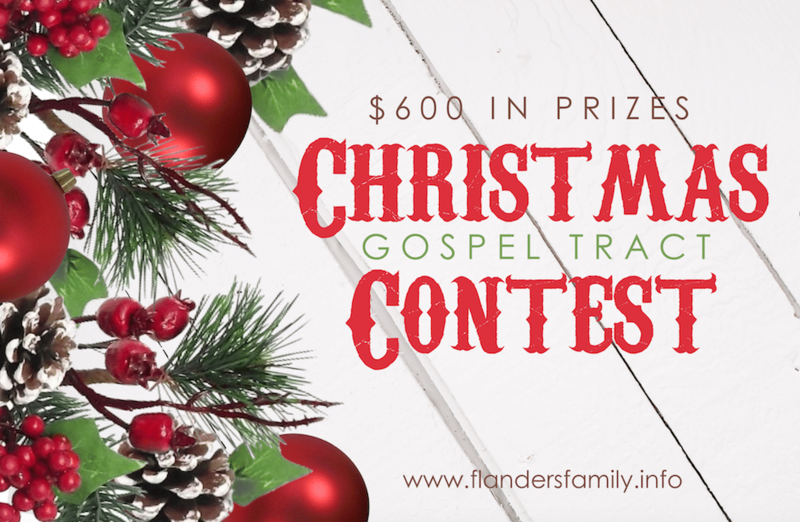 All entries must present a short, gospel-centered message and should include relevant Bible verses that back up whatever points are presented. Every one of us willfully and habitually does things we shouldn’t do — something the Bible calls sin. (Romans 3:23) Our sin separates us from God (Isaiah 59:2) and leads ultimately to both physical and spiritual death. (Matthew 10:28) In fact, death is the guaranteed payment we earn when we choose to sin. (Romans 6:23) Of course, this part of the story is actually bad news, but we must rightly understand our desperate need to fully appreciate the good news that follows. Of course, the above outline is too detailed to fit on a single-fold gospel tract, so please present the gospel in your own words, being careful to back up what you say with Scripture. You may draw from the Bible verses listed above or use personal favorites. Please note that all supporting Scriptures must be taken from the Old and/or New Testament. No citations from Apocryphal writings, Book of Mormon, or any other religious books will be accepted. Although I’ve never posted any Christmas-themed tracts before, you can get an idea of the layout we’re looking for by studying the trick-or-teat tracts we’ve published in the past. You can view samples of those here and here. Please be mindful that all entries must be received by 11:59 PM on Saturday, December 8, 2018. Winners will be announced and printable versions of their tracts will be posted on or before Wednesday, December 12. One last thing: Could you please do me quick favor and share this contest with any family, friends, or school/church/scouting groups you think might be interested in participating? We’d love to get swamped with entries for this contest, too, and would be ever so grateful if you’d help us get the word out! Thanks bunches!